It’s hard to believe it has been five years since that fateful day when my husband Claude made the decision to take his life. This may sound strange but I am truly grateful for all that has transpired since his death. That’s right, the good the bad and the ugly, every last bit of it. It has shaped who I am today. To say I have been through a lot during that time is an understatement. I have truly come through the fire fully transformed and rising again from the ashes of grief. I don’t mean to imply that I no longer feel multiple aftershocks of my loss. I absolutely do. If you had asked me a month ago how I was feeling about the upcoming anniversary I would have said “I am in a pretty good place with it”. Alas, as I have been moving closer to the anniversary I have been feeling increasingly shaky, vulnerable, anxious, sad and sick to my stomach. Due to the devastating nature of his death I find myself feeling tearful and reliving the events leading up to the final day of Claude’s life. My body remembers. Even with the trauma work that I have done to heal this unimaginable wound I am still experiencing the effects from that one unforgettably haunting moment in time when I found his lifeless body hanging in our attic. Clearly more healing is needed around this piece. Yet facing these feelings and memories now as opposed to previous years I am able to move through it with greater ease and grace. The immense power it once had over me, thankfully, has been defused. Reviewing these past five years I have the utmost reverence and respect for the woman who I was and the woman who I have become. I see the magnitude of what I have faced, the strength I have harnessed, how much I have healed and evolved since losing my beloved Claude. It has not been easy. These have been the most painful and challenging years of my life. A rich path filled with darkness and light moving hand in hand, interconnected, together as one. I have learned to not only survive but thrive despite my loss and trauma. There are many things that have contributed to my ability to heal, find peace, joy and meaning once again in my life. I recognized early on after Claude died that I had an important choice to make. I could choose to live a life filled with pessimism, anger, sorrow and despair, void of any hope or meaning. Or, I could choose to empower myself by learning over time what I would need to heal and grieve this loss, reclaiming and re-creating my life. I chose the latter, doing everything in my power to heal and co-create a new life for myself and my son. We all have an opportunity to choose at any given moment, it is never too late to change course. Without my persistence and resolve I don’t think I would be where I am today. In those many moments when I had reached rock bottom emotionally, when the pain was excruciating, I had to reach even deeper inside to find the key. The key to my existence. The key to living and loving once again. I had to recommit to my life and living it as best as I could. I had to affirm that I could and would get through this. An equally important component has been reaching out to healers, therapists, etc. creating a team of support, helping me every step of the way. I could not have done this alone. I not only gave myself permission, I made the conscious choice to step into my grief repeatedly full on, head first into the deepest depths of pain and despair. Knowing that it was required for my healing kept me going and choosing it again and again. With others by my side I felt a safety net and the encouragement I needed to keep moving forward. Standing tall in who we are, remembering who we are with the power of Spirit coursing through us at every moment. This is where we find our strength, this is where we find our resolve. This is where we find our peace. Through it all we remember, we remember. We are asked to stand in our grief but usually not feeling so tall as we do so. When we can rise up to remember our soul’s journey through all of these chaotic emotions we can find our salvation even if only for a moment. With time these moments become hours, become days, become months. This can help us find perspective and understanding through this journey called life. For me this perfectly illustrates how being out in nature gives us the opportunity to slow down and remember who we are in essence. When we can allow ourselves to “Just Be” in the quiet and stillness we give ourselves the space we need to listen to our own inner guidance. This remembering holds another important piece of the puzzle for me, putting things in the greater context of our existence. Remembering that there is always a bigger picture at play. In any given life experience, even when it feels so unreal and beyond the scope of our imaginings, our souls have our backs. We are always being watched over and taken care of. We just need to ask for help along the way. I am grateful to find continual comfort in this, carrying me home time after time on this journey. 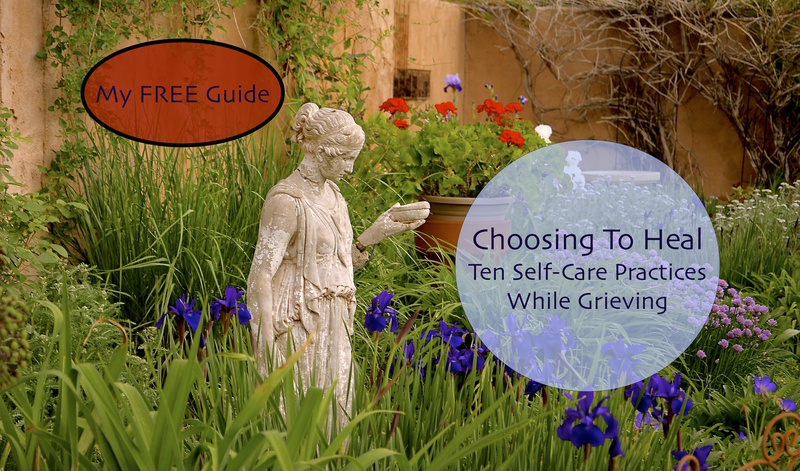 If you are grieving or in a difficult situation, I encourage you to remember that you and only you can choose how you will respond to this challenge. You can choose how you will proceed with your life from this moment forward. You can choose what you will say YES to, what path you will you take. I choose to say YES to love and the magic and the mystery that life holds for us all. What will you say YES to? A note of gratitude: This is also my first year anniversary of launching this blog. To those of you who have joined me over the past year as readers and followers I am humbled and grateful beyond words. Writing about my experiences with grief has been a labor of love and will continue to be. I have heard from many of you privately that my posts have touched you in a variety of ways. I have also heard that it is somewhat scary and intimidating to publicly post comments. Believe me I get it! Each time I click the “publish“ button for my latest post I take a deep breath and hope for the best. If you can muster up the courage I would love to hear from more of you in the coming year. If you think your voice is not important, think again. Your voice really does make a difference. It helps to keep the embers in the fires going and inspires me to keep writing. I would also be grateful if you could spread the love. If you know of anyone who might benefit from this blog, please feel free to share so that more of you can be supported and we can grow in this community together. I plan to write at least one blog post per month so stay tuned for more as the year progresses. From my heart to yours, thank you for your support and reading what I have to share it means the world to me. Yet another courageous and encouraging post. Right on!!! You are such an inspiration! I am deeply touched by your commitment to healing on your own journey and sharing your strength and insight – like extending a loving hand to help others along their path. Loss is not something we choose, so thank you for responding to the loss of your husband in such an honest and uplifting way.